You can reblog a WordPress.com post to your own site by using the reblog button. 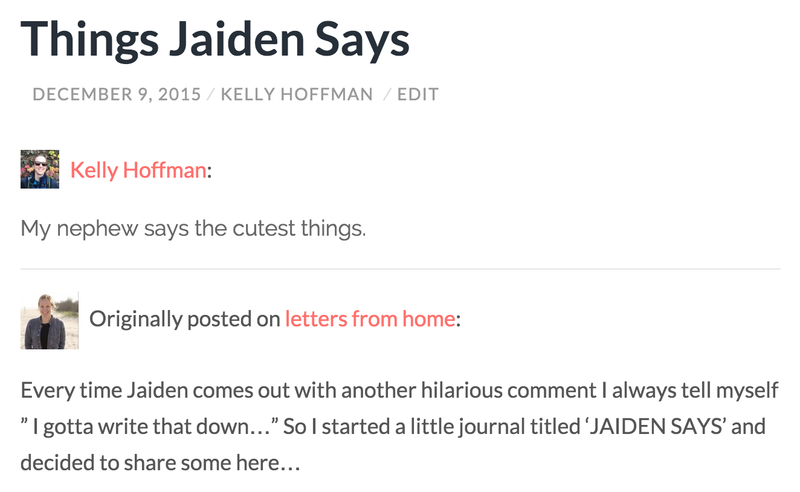 Kelly, which was designed by Automattic’s own Kelly Hoffman, is an inviting, fun theme for bloggers of all stripes. Its clean, one-column layout makes it perfect for text-heavy posts, but can be just as ideal for a tumblelog-like stream of images. With bold featured images, the ability to customize the header and the background, and three widget areas in the site’s footer, you can make it your own with just a few quick tweaks. Here are some examples of the theme’s versatility. Curated Style, a Toronto-centered fashion blog, makes great use of Kelly‘s out-of-the-box look. The theme’s cursive font in the header injects a stylish playfulness, while the generous white space in the posts makes the images of Toronto’s fashion scene stand out.